Spring break is coming up soon and I've been brainstorming for a couple of things to do with the kids that week. I think we'll make a rock garden. I buy a big bag of rocks at Home Depot, and then rinse them under water quickly and let them dry in the soon. To prep them, I paint the tops of them with white house paint. The rocks are porous and you could spend all day trying to cover them with regular craft paint. Once the first coat of white paint is dry, they will be ready to paint. If you already have one or you do one too, let me know. I'd love to show the kids some pictures! what a great idea...they are wonderful!!! I love this idea. Too cute! I just painted a rock last week. Going to do some with my son later on today (if all goes well). He saw my rock and wants to paint some himself. I love your idea of having some in a bowl for guests to have. I might have to steal that idea. these are so bright and beautiful. i love the idea of giving them to guests as they leave. LOVE this idea! I will definitely do this with the kids over break and funny thing is I bought the exact rocks yesterday! I didn't know what I was going to do with them. How weird is that? Thanks! I want to do something like this when I'm an art teacher and mommy! love this idea! Chrissie, I love these! I would like to link to them in an upcoming post, and I was wondering if it would be all right if I used a thumbnail of your photo (with your copyright message on it, of course) to link back here. sorry I just reread your post and found the answer. Are you able to find house paint in small quantities though? 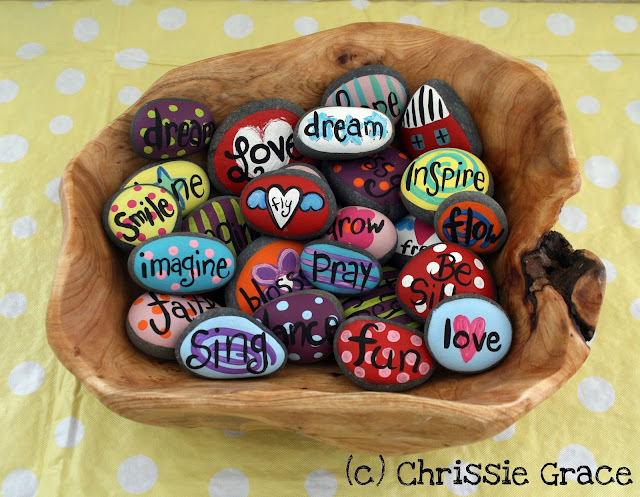 Just love these colorful fun rocks!! Such an inspiring little craft!! We first started painting rocks about 10 years ago. It was a great camping activity. We had quite the collection of dinosaurs, lady bugs, rabbits, faces, frogs, etc. It is actually very relaxing and fun. I resurrected this activity this past summer. We painted rocks and then placed them along the road at our campground. As people walked by they would notice the rocks and come morning all were gone! It was such a great experience for the kids and a great learning moment about doing little things to brighten a persons day. I love that you kept them by your front door for people to take!